Anafi, a small island located east of Santorini in the southern Aegean, has historically produced some of Greece’s best builders. In the 19th century, after the country’s liberation from Ottoman rule, the newly-arrived Bavarian King Otto summoned craftsmen from Anafi to build his palace – today the seat of the country’s Parliament overlooking Syntagma Square. These same craftsmen were commissioned by wealthy Greeks – many of them war heroes – to build the imposing mansions that we still see in Plaka today. The Anafi builders toiled to put roofs over the heads of many prominent Athenians, but it never occurred to anyone that they had nowhere to live themselves. It is said that the Oracle of Delphi had decreed centuries earlier that no construction should take place on the north side of the Acropolis, possibly to preserve the area’s sanctity. The first homes built there were those of two homeless Anafiots, who worked over the course of two nights so that authorities would not be wise to their activities. Many of their compatriots then followed suit, giving rise to the tiny neighborhood of Anafiotika (of the Anafiots). During the day, they built stately houses for the Athenian elite, while at night they constructed small yet functional residences for their families, with pretty gardens, narrow alleys and broad steps, which reminded them of home. Their artistry, technical mastery and respect for the natural landscape was such that, had their homes not been painted a brilliant white, they would hardly stand out from a distance. The Anafi builders worked quietly through the night to erect the first humble homes located right at the foot of the Acropolis. There are still no individual names for the snarl of alleys that make up Anafiotika, stretching from Stratonos Street to the foot of the Acropolis, so houses are distinguished by the postal service as “Anafiotika 1,” “Anfiotika 2,” etc. 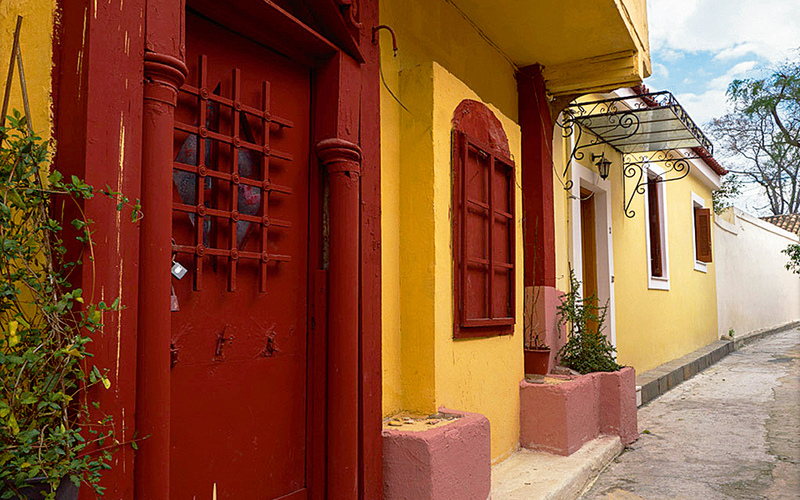 One of the prettiest among these is “Anafiotika 4,” with a beautiful garden of lemon trees and wild rose bushes. I always find a walk around Anafiotika calming, even though it lies in the middle of a noisy metropolis. 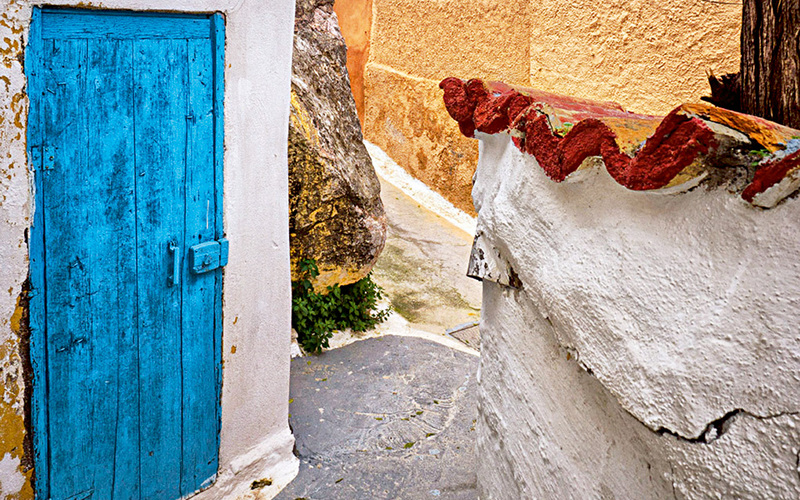 So, enjoy a tranquil stroll through the narrow streets, lined with flowers planted in big oil or cheese drums; the colorful shutters contrasting with the white walls; and the ornate doorways – it is much like being in Anafi itself. This is a tiny church on Stratonos Street that was built in the 17th century, and renovated in the 19th, by the Anafi builders who created the neighborhood. 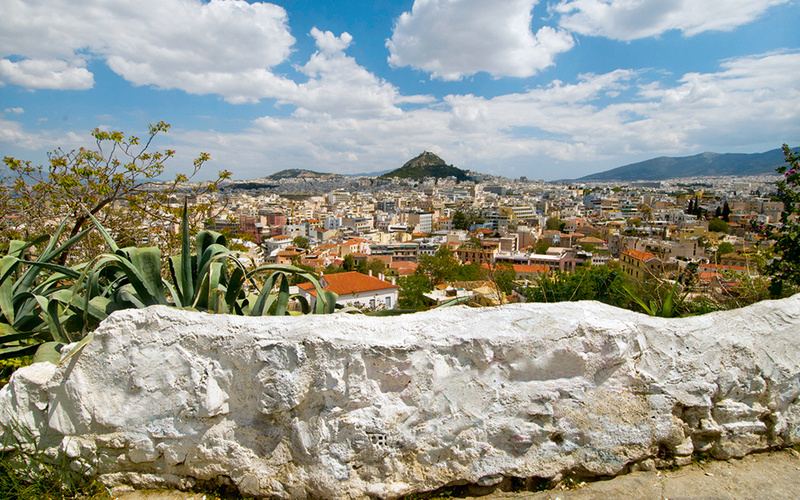 It is named thus because it is right at the base of the Sacred Rock of the Acropolis. This was home to the first university of free Greece, which operated from 1837-1841 in an Ottoman-era residence that had been renovated by Stamatis Kleanthis and Eduard Schaubert for the headquarters of their architectural firm. Exhibits from the university’s first schools (medicine, law, philosophy) are presented in the halls of the old university, including rare books, manuscripts, letters, etc. opening hours are Tuesday, Thursday & Friday 9.30 a.m. – 2.30 p.m.; Monday & Wednesday 9.30 a.m. – 2.30 p.m. & 6-9 p.m. in the summer; and Monday-Friday 9.30 a.m. – 2.30 p.m. in the winter. The collection, donated to the Greek state in 1972 by Paul and Alexandra Kanellopoulos, comprises 6,000 objects and works of art, dating from prehistoric to modern times, which trace the remarkable evolution of Greek art through the ages.